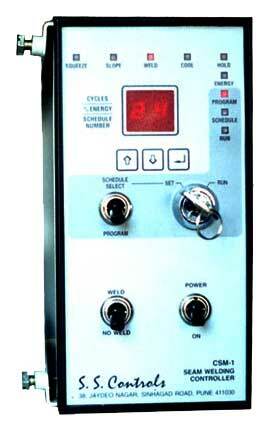 We bring forth high precision Seam Welding Controllers in the national and international markets. The Micro Controller Based Seam Welding Controllers that we supply in the industry are used in Resistance Seam welding machines of any capacity and make. They have compact user-friendly micro controller based circuitry with non-volatile memory (EEPROM) to store up to 15 welding schedules. The key lock switch is provided for SET & RUN mode and WELD / NO WELD switch is also there on their front panel. In addition to this, we are one of the major Resistance Seam Welding Controllers Manufacturers in the country. Easy to program with UP / DOWN and ENTER keys. A two-digit LED display indicates set values. Individual operations within a weld schedule indicated by LEDs. Key lock Switch provided for SET & RUN mode. WELD / NO WELD switch provided on the front panel. Timings settable in terms of HALF / FULL cycles of mains supply frequency to achieve better resolution. Precise time and energy control ensures consistent weld quality. Relay contact output provided to actuate the Motor Drive of the welding machine. Compensation : Supply voltage fluctuation compensation. (Output voltage remains within Â± 3 % as against Â± 15% variation in mains voltage). Trigger : External Normally Open contact of footswitch or limit switch. Resistance Seam welding machines of Any Capacity/ Any Make.